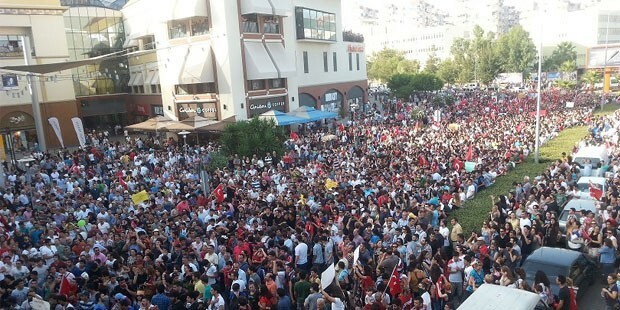 In the second Gezi Park court case underway in Mersin, 52 defendants are being tried for taking part in 2 protest marches on the 20th and 30th of June. The indictment was written by a prosecuting attorney by the name of Cihat Gezmen. Gezmen’s report states that the defendants were “allegedly protesting against the Taksim Gezi Park construction works”. In other words, the official indictment does not even concede the actuality of a disenchanted body of citizens resisting against state oppression. Whats more, one protester’s (Osman Yılmaz) statements directed at the police during the protests where he said “this is our constitutional right. Allow for us to walk to Peace Square so the people’s anger can be vented. On such a day, we don’t want hateful images in Mersin” were recorded as criminal evidence against him. Another protester’s (Ali Sesal) tweets were judged in the light of “summons via Facebook and Twitter for an illegal protest”. The defendants are being tried for; contesting the Law on Demonstrations and Public Meetings (Law 2911); damaging public property; insulting public servants; resisting the police and taking part in a public meeting with weapons. Excuse my cynicism (not that I’m refuting the possibility of the presence of those with weapons) but in the context of the Gezi protests, the courts have been treating gas masks and constructions helmets as weapons. What bothers me most is the way in which the term ‘allegedly’ (sözde) creeps into official indictments which holds long lasting effects in terms of delegitimising certain existing actualities.